Self-care was the most searched term in 2018 — now, it’s being used to privatize mental health treatment through cell phone apps. NPR’s “The Millennial Obsession with Self-Care” states that “millennials might be the generation of emotional intelligence.” That emotional intelligence is obvious in social media; from Twitter threads on what kind of bath bomb is best to YouTube videos detailing breathing exercises for relaxation, it is hard to go on any social media site without seeing the word “self-care” somewhere. Self-care app features can range from tracking a sleep schedule, guided meditation or tracking healthy eating habits to connection to suicide hotlines and emergency medical contact. Personal Counselor Amanda Whitcomb fully believes in the efficacy of self-care apps. Whitcomb has her students try apps, just as a way to relax and seek help when they can’t get in touch with a therapist. 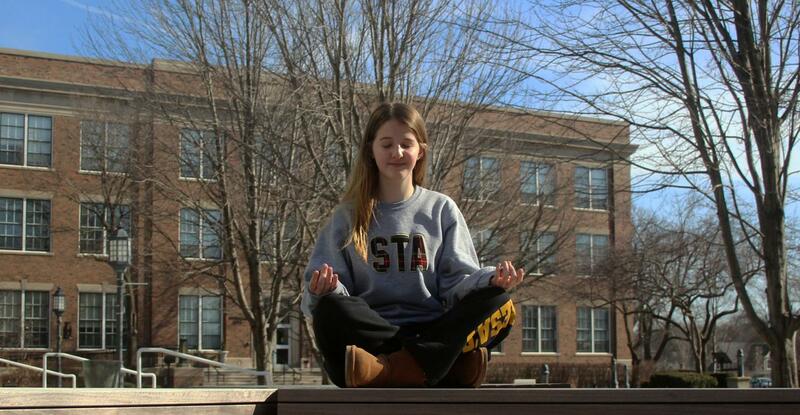 Students in the STA community are beginning to incorporate self-care apps into their extra-curricular activities. Freshmen Claire Fanning, Abby Leardi, Bella DeZeeuw and Madonna DiMartino recently developed a suicide prevention app that collects typed responses to questions relating to the user’s mental health. The app was created for eCybermission, a U.S. military sponsored program that inspires middle and high school students to create prototypes for science. Science teacher Renee Blake supervises the program at STA, and the group signed up to be a part of the competition at the beginning of the 2018-19 school year. “We chose suicide prevention because we see people who are stressed and overwhelmed everyday around us, and we have learned that it is an issue of teens that has been occurring more and more,” Fanning said. Senior Elise Malone, who is also a supporter of self-care apps, found herself using them to distract herself in periods of stress. The app that Malone used primarily, Calm Harm, has four categories of care: distract, comfort, express yourself and breathe. According to its App Store description, It was developed specifically for teens and uses a treatment technique called Dialectical Behavior Treatment, or DBT. According to Psychology Today, DBT is “an effective combination of cognitive and behavioral therapies. The goal of DBT is to transform negative thinking patterns and destructive behaviors into positive outcomes.” DBT is used with patients of all backgrounds to regulate emotions and aid de-stressing. While it is generally used in face-to-face therapy, self-care apps are finding ways to incorporate it into their code. Calm Harm specifically uses DBT to steer people away from the urge to self-harm. However, Calm Harm themselves state on their website that they are not a replacement for professional treatment. Whitcomb believes in the usefulness of apps, but also recommends students to seek therapy when necessary. “You want to make sure you have other coping mechanisms, especially ones that allow you to be around safe, comforting people,” Whitcomb said. Malone also believes that apps can only go so far in the treatment of mental illnesses. Malone and Johnson’s thoughts on therapy versus apps are common in the medical field; the American Psychology Association cautions people using online forms of therapy to find other support systems as well as their apps. Their article on choosing online therapy argues that there hasn’t been a lot of research on these apps, and seeking professional, face-to-face support might be the better option.